It seems weird, but homemade bacon is one of the easiest recipes I know – and now it’s one of my favorites. Part of it is because I have a great smoker: it’s a Masterbuilt M7P, and it grills, smokes (both with charcoal or with propane), and has a few other attachments to allow for steaming, boiling, frying, and even campfire cooking. But I digress. Point is, you need a smoker. You can get a good one for the same price you paid for that fancy grill you have in your backyard right now, and this can grill or smoke. Once you have the equipment, the ingredients are relatively easy. 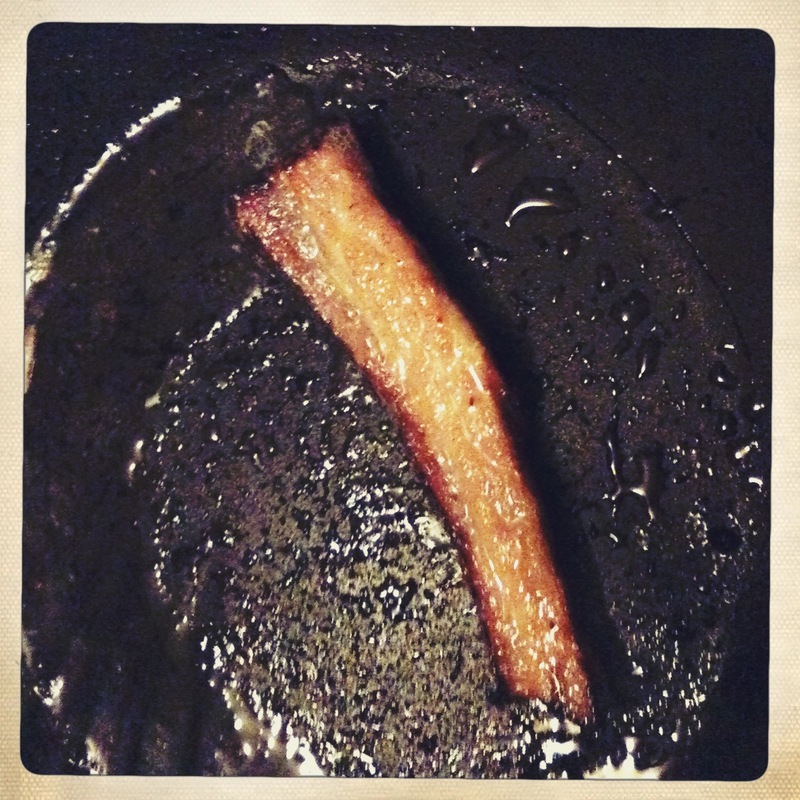 For unflavored bacon, you only need a pork belly, kosher salt and brown sugar. If you want to flavor it, it’s pretty simple to do so. I’ll explain that later. Pork bellies may or may not be hard to find: I live in San Diego, and after messing around the first few times I made bacon with going to a commissary (you need a friend in the military to take you shopping for that to work) and going to a fancy butcher shop (waaaay to expensive), I settled on buying my pork bellies from a local Korean grocery store. They are quite cheap ($5-$7 for about a pound and a half), and the bellies are already helpfully trimmed into lovely little blocks, just waiting to be cured and smoked. Step 1: Once you get the belly home, place it in a large (gallon size) freezer bag, and add one cup brown sugar and two cups kosher salt. [Note: if this doesn’t coat your pork belly completely, add more of both sugar and salt, just make sure there is twice the amount of salt to sugar.] Make sure the salt and sugar is both completely mixed and completely coating the meat. Refrigerate. Depending on the size of your pork belly, this curing process will take between 2-7 days (7 is for a really huge, dense piece of meat – most pork bellies will take between 3-5 days.) You will be able to tell the belly is cured when the freezer bag has liquid in the bottom and the meat is hard to the touch. Step 2: Remove the meat and rinse the salt and sugar off, and put it on a clean plate. Now is where you add flavoring if you desire; I recommend either coating the belly with cracked peppercorns, (real!) 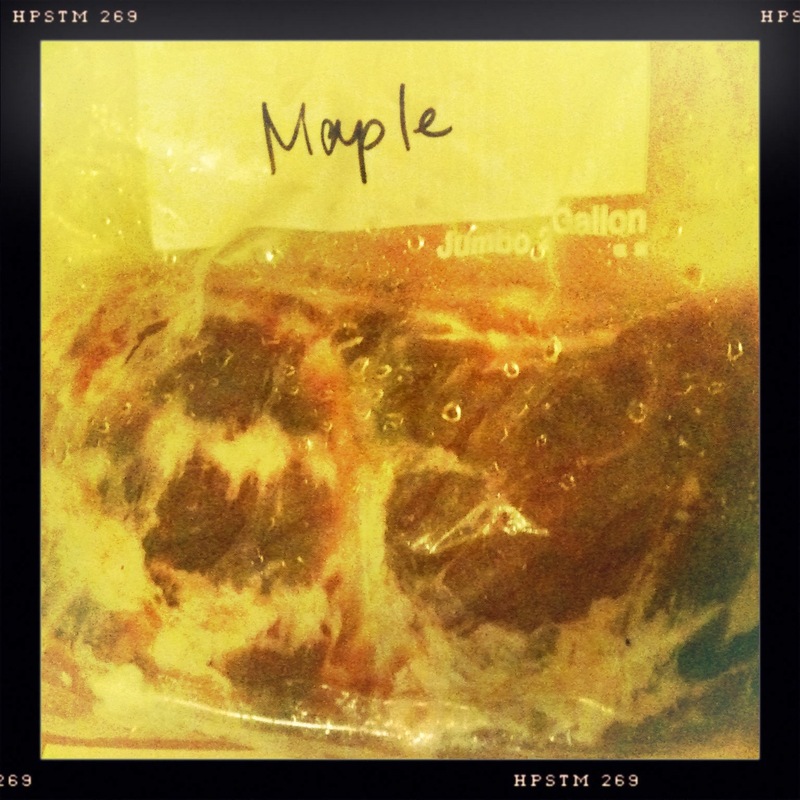 maple syrup, or even sriracha for a spicy bacon. Step 3: Place the belly, on the plate, flavored if you like, with no cover or wrap, in your refrigerator. This will cause an invisible film to develop on the meat, which will act like a magnet for the smoke when you smoke the meat. Leave it this way for at least 12 hours (preferably overnight). 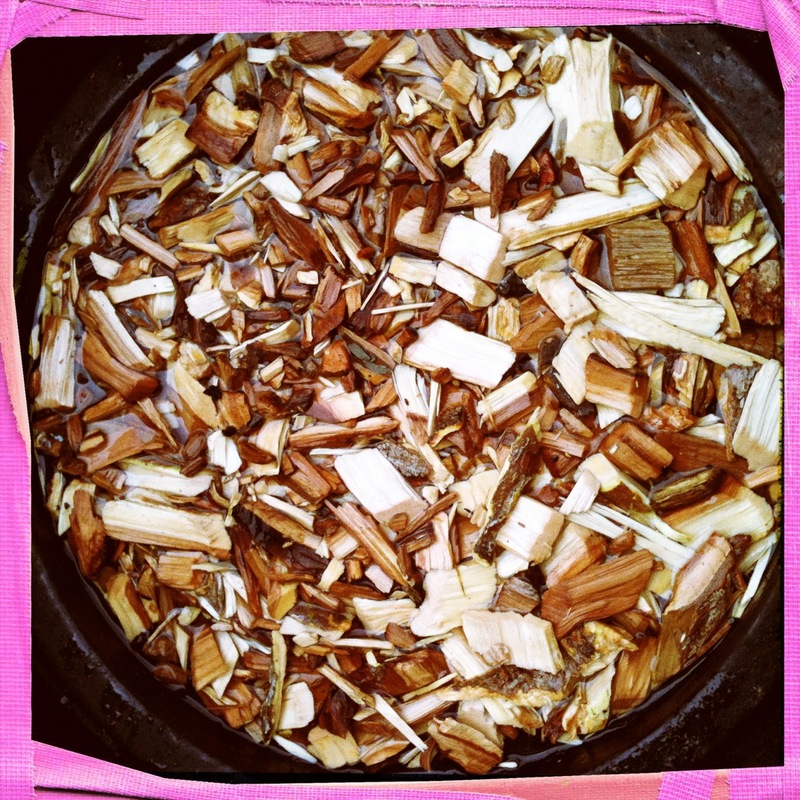 Remember you will need to soak your wood chips for smoking, too, so this would be a good time to put them on to soak! The next day, remove from the refrigerator and let sit for about 20 minutes (just to bring it to room temperature) before smoking. 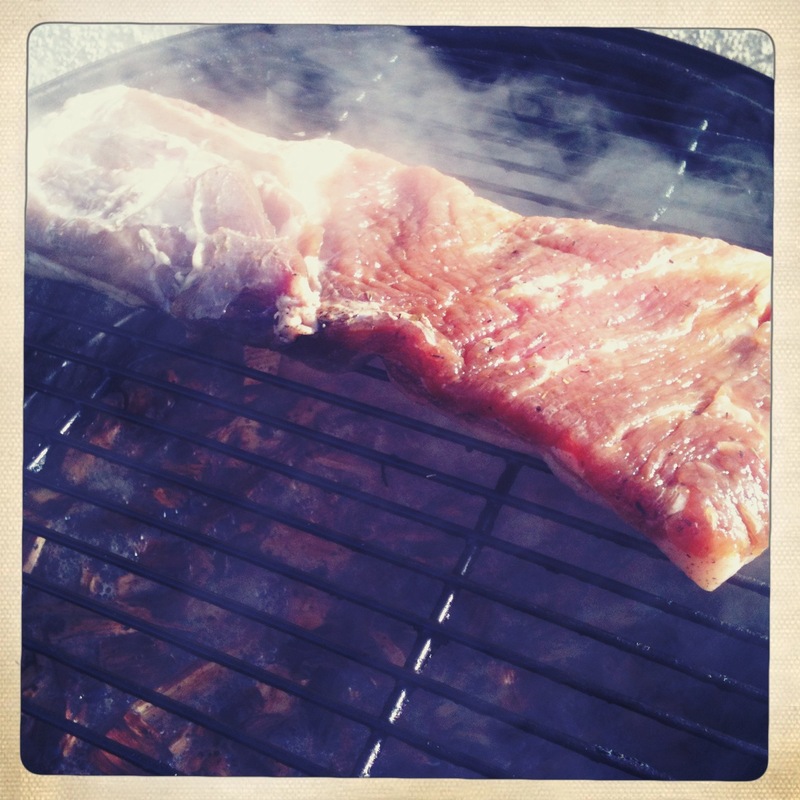 Step 4: Smoke it! Keep your smoker’s temperature between 200-300, and depending on the size and thickness of the meat, the smoking will take between 4-7 hours. 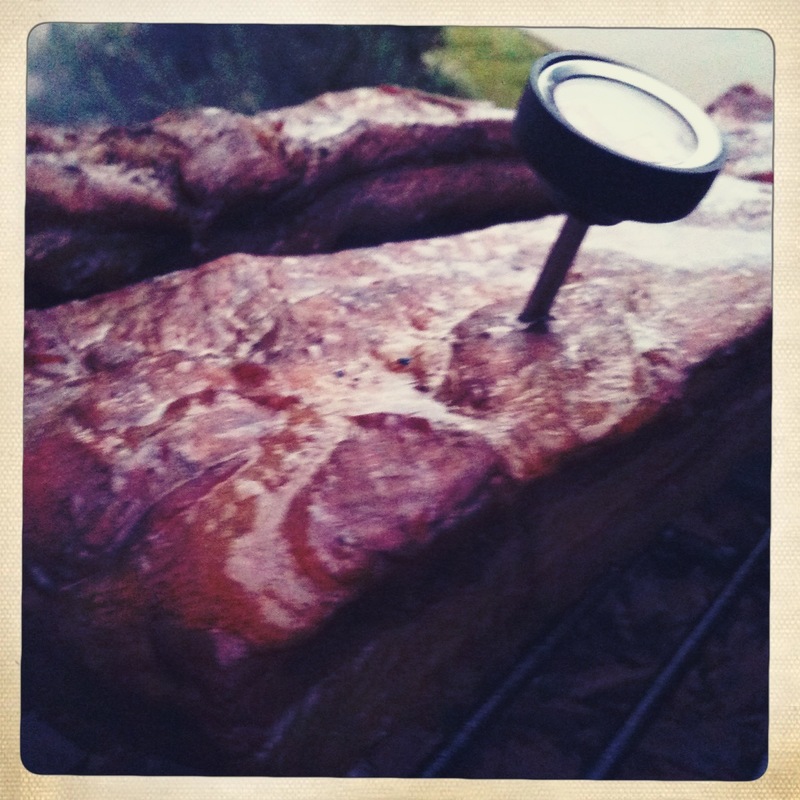 Make sure you use a digital meat thermometer, or otherwise keep an eye on the internal temperature of your bacon. Once it reaches an internal temperature of 160, it’s ready, but feel free to smoke it longer to increase the wood-smoke flavor. 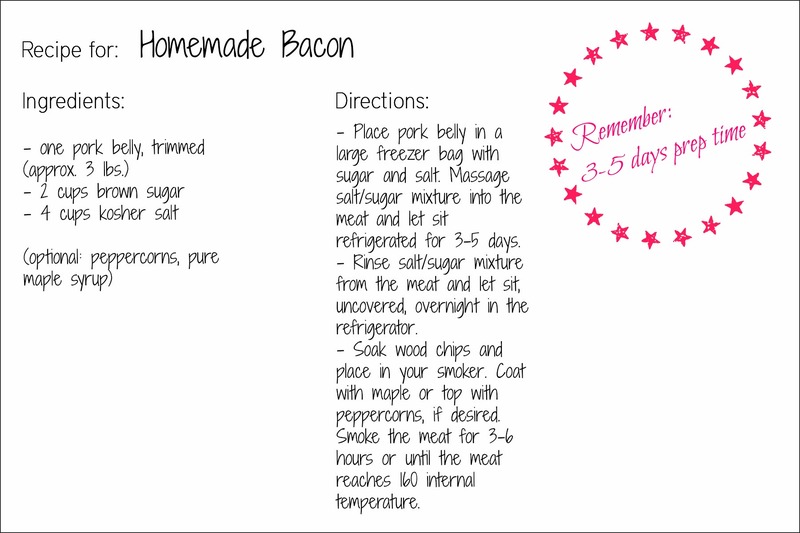 Save or pin this recipe card for easy use! Create your own bacon. At home. No, really. Who knew that it could be so darn easy? 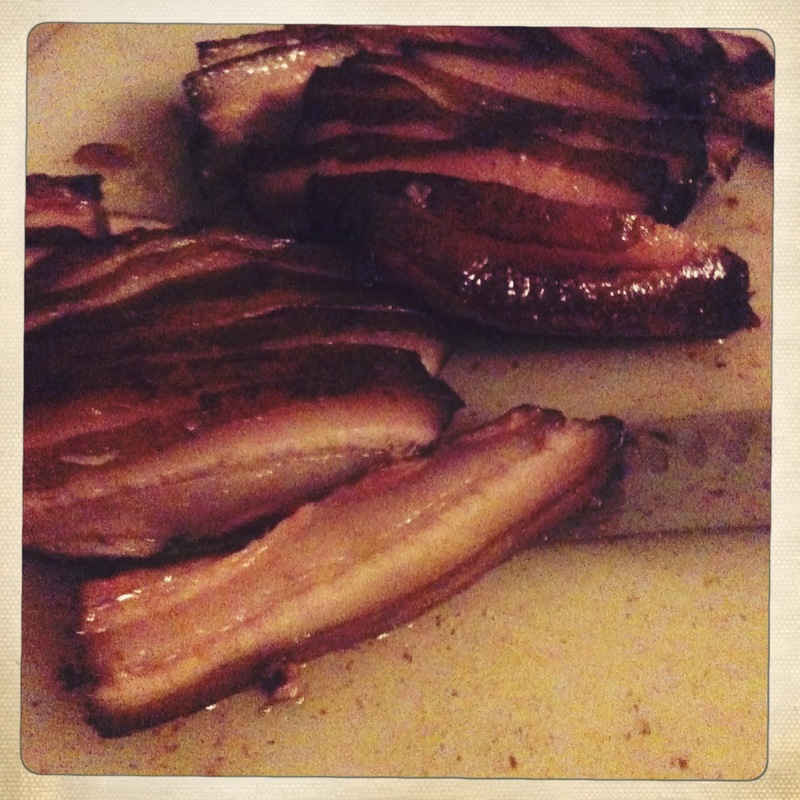 If you have a smoker, a pork belly, and some salt and spices, the magic that is homemade bacon (i.e., home-cured in your fridge and home-smoked) can be all yours. I embarked on this awesome adventure with my friend and fellow food blogger The Neighborhood Foodie, who for the last couple of months has been working in Amsterdam, so we haven’t gotten to nerd out on a cool project in a while. 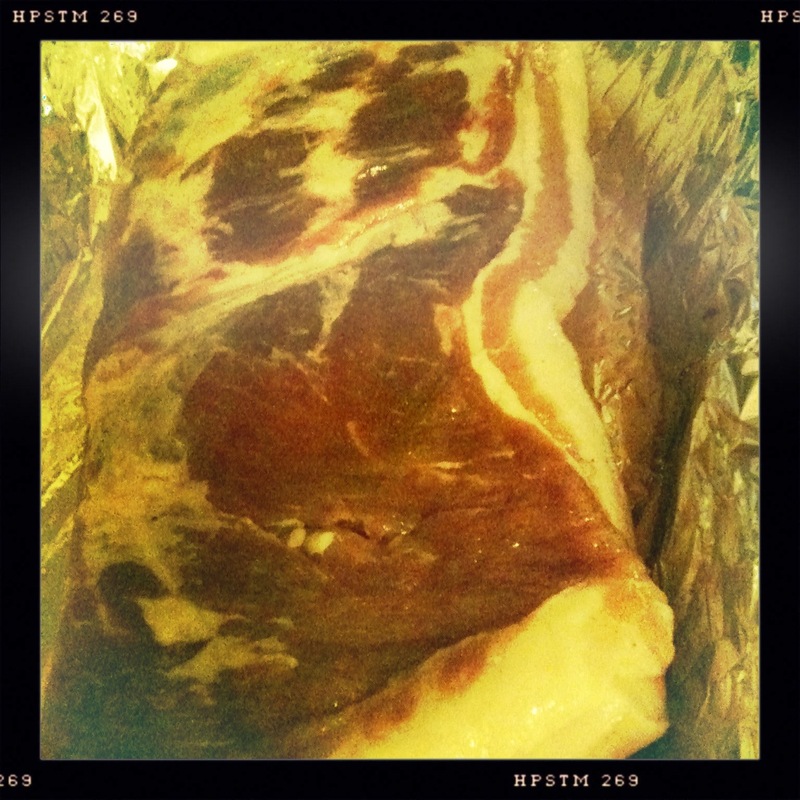 She took a stay-cation in San Diego at the beginning of January and we decided to go food-blogger crazy and make some of our own bacon. 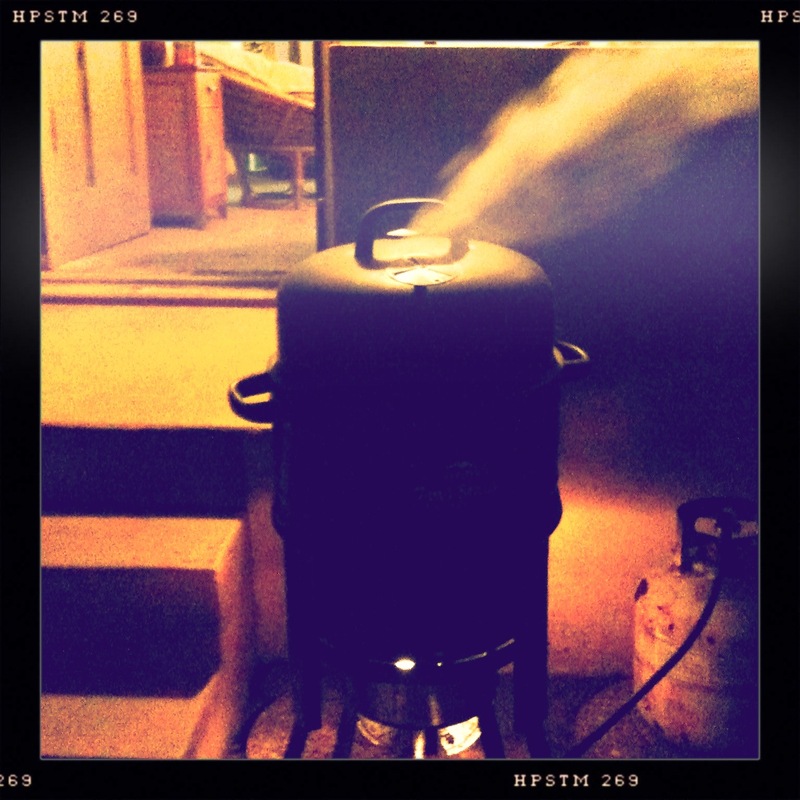 As my house is the one with the smoker parked outside, it needed to be a joint venture. 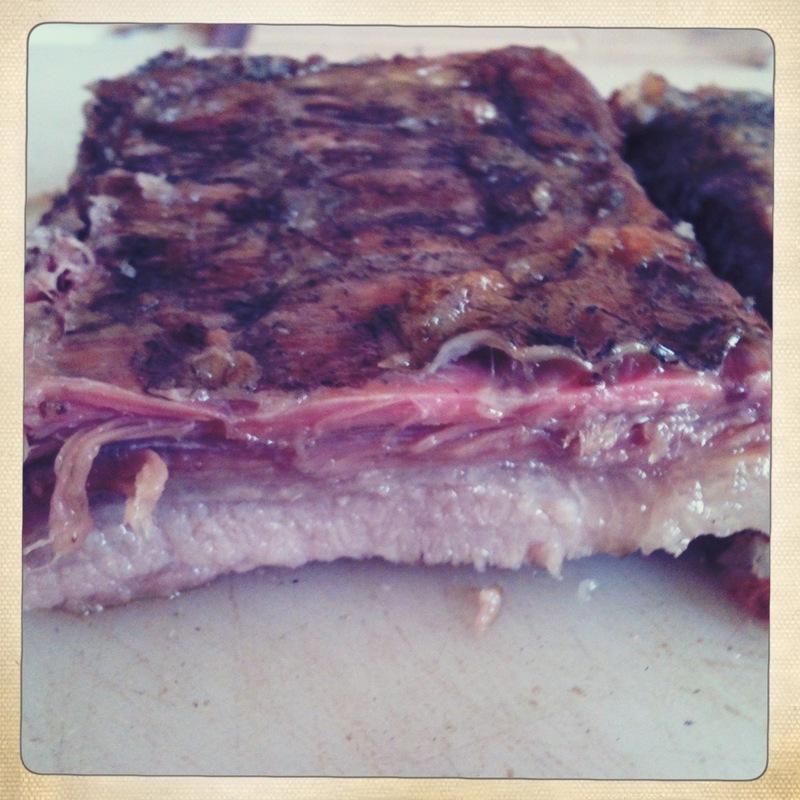 About a week before we got started, she purchased a few slabs of pork belly (ask your local butcher to hook you up), and used a recipe with no nitrates or preservatives. Just salt, sugar, time, and love. Trust me: once you try this, you’ll never miss that nitrate-filled, preservative-packed bacon from the store. It’s a two-step process: curing and smoking. 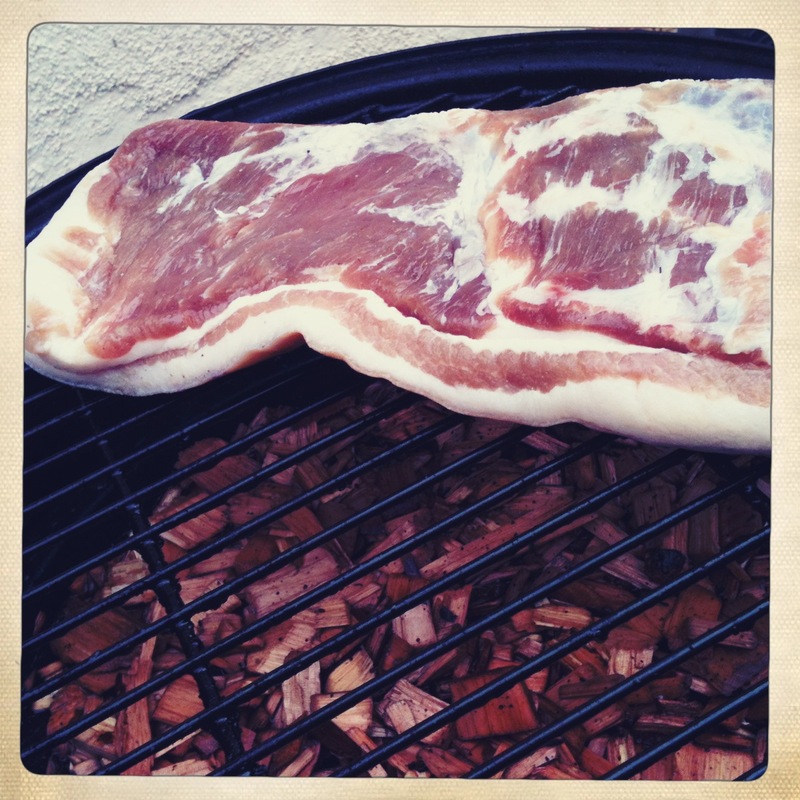 Both steps are needed to turn pork belly into bacon. Both can be done at home, if you have a smoker. * I want to interject a side note here about my M7P 7-in-1 Outdoor Cooking System. I bought this online (Overstock) for about $150 with free shipping. It cost another $40 for a used propane tank. This baby grills, smokes, boils, steams, and fries, and you can do any of those tasks with either propane or charcoal heat. It’s the best $150 I ever spent. I highly recommend this model (no, I haven’t been hired by the company or anything) or a similar multi-tasking machine. Trust me. After you do a cool project like bacon — or smoked garlic, or smoked jalapenos, livers for a sweet pate, or a nice beer-can chicken, or cedar-planked salmon and brie, or a holiday crab boil (it also comes with a steamer pot and a big stainless steel pot for boiling) or just a nice grilled piece of chicken or pork with minimal effort — you will see. This thing pays for itself. For every 5 lbs. of pork belly, mix 4 cups of kosher salt and 2 cups of brown sugar, coat the pork as well as possible, and refrigerate it in a freezer bag or loosely wrapped in plastic (I’d recommend the bag, because it gets pretty wet in there). If you are adding other spices or flavors (we did one slab with Jamaican jerk seasoning, one with maple, and one with chili and cocoa), add it at this point. If you are coating the bacon instead of flavoring it — say, in ground peppercorns, for example — you will want to save that for after it’s cured and before you put it on the smoker. 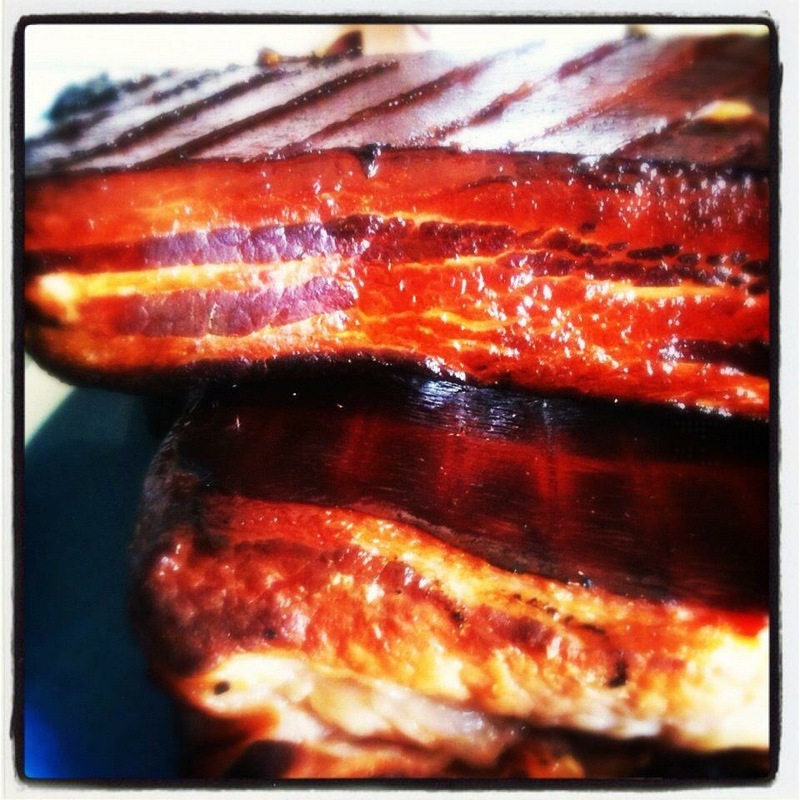 If you have done a few searches for homemade bacon recipes before you settled on this awesome blog, you’ll probably notice that there are a lot of opinions out there about how to do this right. Some cooks swear by “pink salt” – salt and nitrates, used for preserving the color of the bacon – and insist that it is part of every bacon recipe, and some cooks insist that you don’t use any such thing. Others, like us, prefer to do it au naturale, like this Cool Material post. It’s up to you and you have to do what makes you feel right. We opted for a more natural recipe with simple salt and sugar, and without all the preservatives. The only down side to having bacon free of nitrates and preservatives is that you have to eat it faster. Darn. Seal the baggie with the pork and seasonings and refrigerate for at least 7 days. Every day or so, move it around and massage the meat a little to encourage distribution of spices and salt. There’s a complicated scientific explanation for what happens inside that bag, but essentially, the salt forces the moisture out of the pork belly, curing it and pushing those juices out. If it’s a lot of moisture you might want to drain it out. After at least 5 days, uncover the meat and rinse off the majority of the salt and flavorings. Let it sit on a plate or baking sheet in your fridge, uncovered, for at least another day. Again, there’s a deep science-y explanation for that happens, but the idea is that this step will create a sort of film over the surface of the meat, which will act like a sticky, gooey magnet for the delicious smoke. 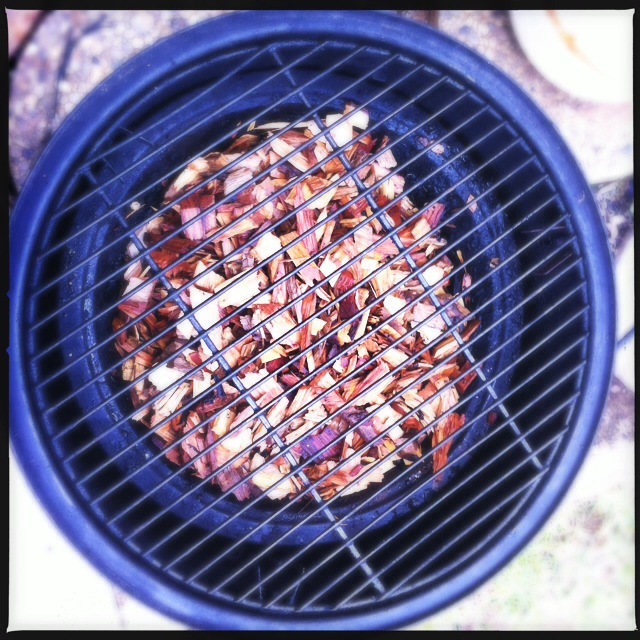 After at least 7 days of curing … make sure the meat is firm, like bacon … it’s ready for smoking. Use your best judgment when it comes to the type of wood; many people use apple wood, cherry, hickory, mesquite, even alder. If you have the time, you can also mix it up and experiment with what sort of wood best brings out the flavor of the meat. After the chips have soaked in water for a couple of hours, fire up your smoker and let it get to about 140 degrees. 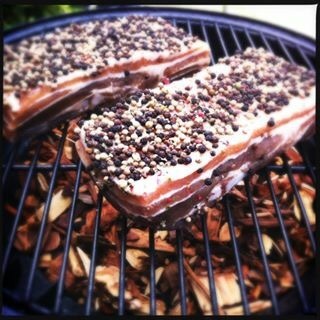 Then give each piece of pork belly a good, thorough rinse, and drop it lovingly and gently on your smoker. Don’t let it get hotter than 200. A slab of meat that is between 2 and 2 1/2 lbs. will take about 2-3 hours to fully cook to the desired internal temperature of 150; but temperature is more important than time, so if after 2-3 hours it hasn’t reached 150, let it continue to smoke until the meat is at 150. 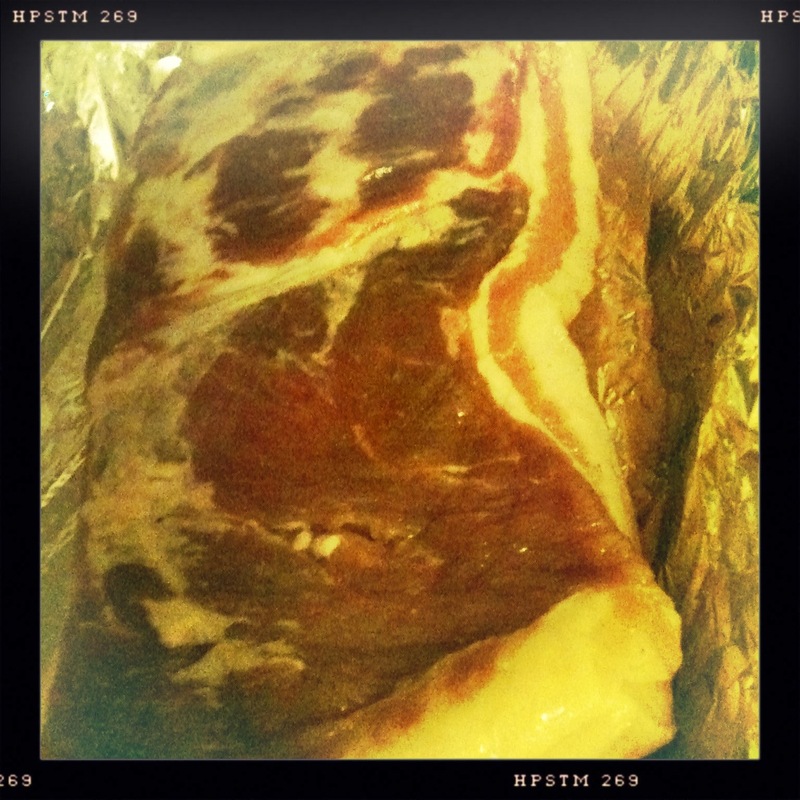 After the bacon is fully smoked, it will still need to be sliced and fried. Since the bacon isn’t packed full of nitrates and preservatives, it won’t look like the pink stuff you buy in the store.